"Consistency is contrary to nature, contrary to life. The only completely consistent people are dead." If you have followed this website for any length of time you know I don't usually list our tentative travel plans. It's not for security or privacy reasons. It's because we so frequently change our itinerary, for a variety of reasons. For us, weather is the most important one. I admit we like moderate temperatures and try to avoid extremes of heat and cold. More critical is our safety, however. When you travel in an RV you have to be aware of potential hazards in your current and planned locations -- things like high winds, heavy rain, flash floods, lightning, snow, or large hail that can ruin your camper where you're parked or make driving from one place to another dangerous. 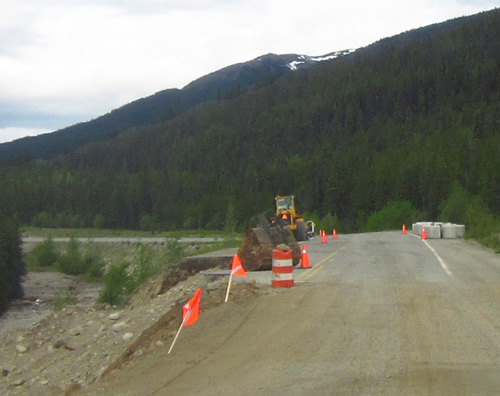 the highway washed out in several places farther to the north between Watson and Kluane Lakes. In addition to weather conditions, sometimes other RVers give us ideas we hadn't thought of, or we'll hear about a different area or campground that appeals to us. We might decide to stay longer in one place if we discover there is a lot we like about it, and we'll sometimes cut a stay short if it doesn't meet our expectations. Those are a few of the reasons we have changed our minds in the past. We like Kings Bay Sub Base near St. Mary's, GA so much we spent the last three winters there. We have so much flexibility in our schedule since we sold our house a year ago that we change our minds about where we're going, where we're camping, and what we're doing even more frequently now than we used to when our lives had more structure. As my brother teases, "You can do that." It didn't take long after our first trip to Alaska the summer of 2012 for us to begin talking about "the next time." 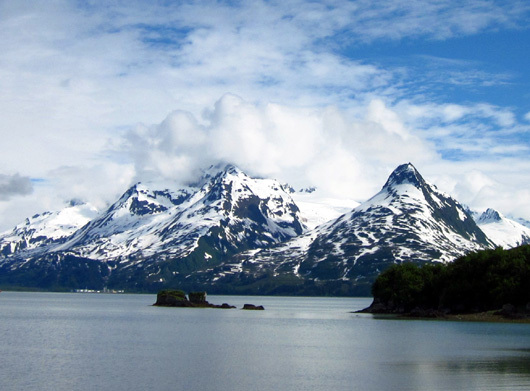 Alaska is so special that we knew we had to go back at least one more time. Different priorities dictated our plans for the summer of 2013. 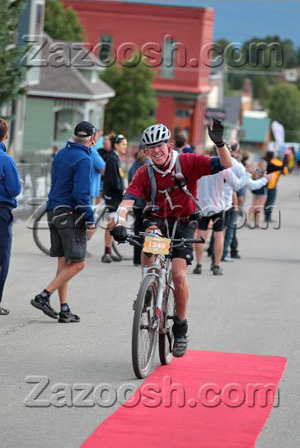 Jim was accepted into the Leadville Trail 100-mile mountain bike race that summer. It's almost as difficult to gain entry in that exceedingly popular event as it is to finish the doggone thing. For a while we thought we'd go back to Alaska the summer of 2014. In January we decided the time was finally right in our area of rural Virginia to sell our house. We put it on the market in April and got a quick offer but didn't close until the end of June, making it impractical to go all the way to Alaska. We needed to spend all summer there to make the long drive cost effective. 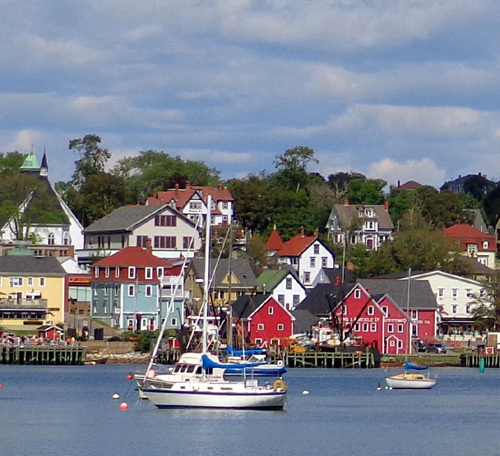 So while we were in the eastern part of the country we chose to head north to New England and the Canadian Maritimes. For the past year we've been thinking about this summer's trip to Alaska and keeping up with its news on the Alaska Dispatch News website. Three years is long enough to kind of forget how long a drive it is and just remember how much we loved the Far North the first time we were there. Tomorrow we're leaving Great Falls, MT and will cross the Canadian border. We'll definitely feel like we're on our way to another fine adventure once we get through customs. The weather, for one thing! The summer of 2012 was colder and wetter in Alaska and northwestern Canada than average. It followed a record cold, snowy winter, so a lot more snow and snowmelt was present when we arrived in the Yukon and Alaska. 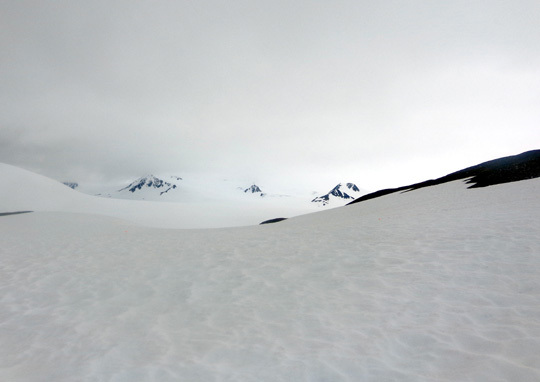 Not only did we experience a lot of chilly days that summer, the snow and wet conditions prevented us from hiking some trails in June and July. It did make for some interesting observations -- like huge piles of snow in downtown Valdez in the middle of June -- and scenic drives -- such as several feet of snow remaining at Thompson Pass, the (or one of the) snowiest places on earth. 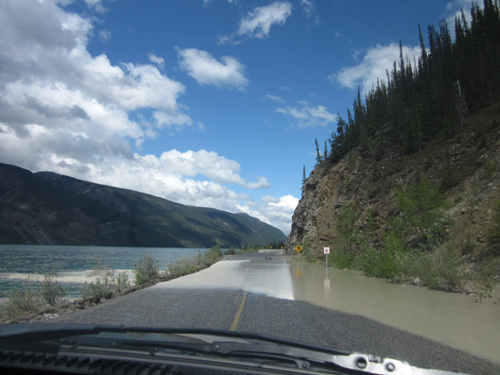 Excess snow, snowmelt, and rain also caused the washouts on the Alaska Highway between Watson Lake and Whitehorse in the Yukon. We won't ever forget the unprecedented five days it took crews to reopen the road while we cooled our heels in Watson Lake in June. It wasn't all that inconvenient for us, just memorable. pavement and culverts washed out. It wasn't much better when we came back in Sept.
We're hoping this year will be less "memorable" in that regard. We're facing just the opposite scenario this time. Anchorage, and probably most of Alaska, has just experienced its warmest winter in the last 60 years with the least amount of snow in one season, only one-third the average of 75 inches. In fact, it's been warmer in Anchorage and Fairbanks and some northwestern Canadian cities during the month of May than it was in Colorado Springs! At least one day was warmer in Fairbanks (86 F.) than in Phoenix (83 F.) or Houston, for gosh sakes. in Alaska and the Yukon than it was at the USAF Academy campground. It will be very interesting to see the differences in the areas we visit this time, compared to 2012. Knowing how warm it is in northwest Canada and Alaska has been frustrating to us in chilly Colorado Springs because we've been itching to get up there. What prevented that was my decision to get my usual three Orthovisc injections in my knees, rather than trying a one-dose injection like Jim did. My last appointment with our new orthopedist was May 28. 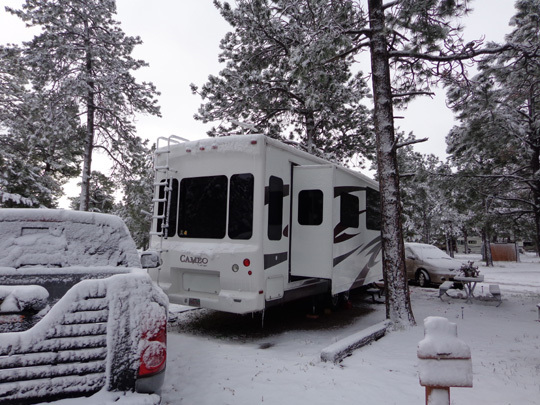 We know more RVers are heading to the Far North two or three weeks earlier this year because of the warm weather. That gives us some concerns about being able to find campsites along the Alaska Highway. We don't want to be in a caravans of RVs. We plan to start and end our drives earlier through Canada this time so we reach campgrounds by mid-afternoon when sites are more likely to be available. 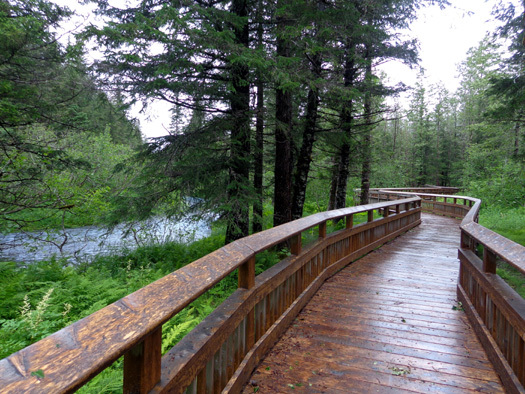 Most of the differences this time should be positive, however -- less chance of washouts on the Alaska Highway, warmer and drier summer days in Alaska, and more access to trails that aren't under snow or badly eroded. On our first trip to Alaska we weren't sure what to expect anywhere we visited. The possibilities were endless and we were like sponges, soaking up as much information as we could from brochures, the internet, locals, and other visitors. We did and saw a lot in three months that summer, but we knew we'd barely scratched the surface. 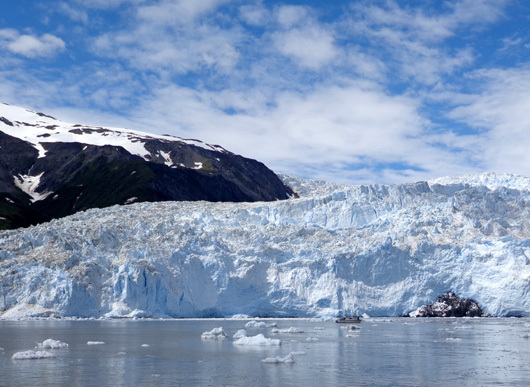 We had a great day cruise from Seward to the Ailik Glacier in 2012. Our goal this time is to repeat some of our favorite experiences from 2012 and add some new ones. 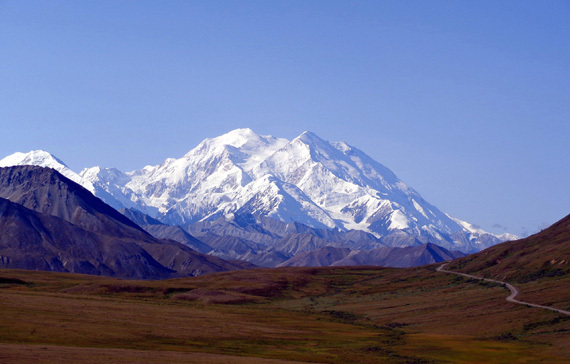 There are campgrounds and areas we loved, like Denali National Park, that we plan to visit again. We will go there at a different time this summer so we can maybe see more wildflowers. Ditto for Valdez, which was an icebox last time in mid-June. Even though it's a warmer spring we'll go there later this time to see what it looks like. under snow in early July, 2012. I'm curious to see what it looks like this summer. And there are places new to us that we'd like to visit -- Haines, Skagway, Stewart-Hyder, Jasper and Banff National Parks, the Kennecott Mines, the Arctic Circle, some different trails and remote roads, and other places. 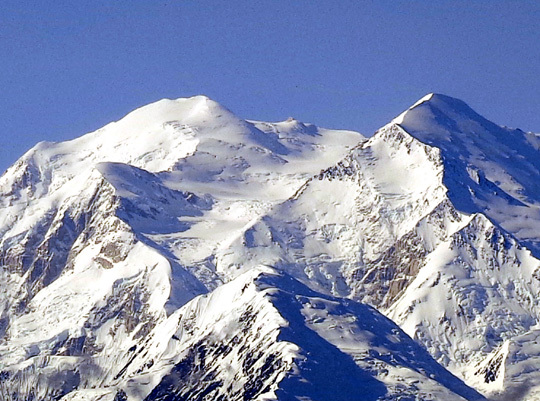 Maybe we'll take a flight-seeing tour in a different mountain range and land on a glacier this time. Or go white-water rafting, or take a train ride . . .
Who knows where we'll end up or what we'll do? That's the fun of making it up (partly, at least) as we go. I feel sorry for travelers who are locked into a rigid schedule and either can't or won't adapt to changing conditions and new possibilities. 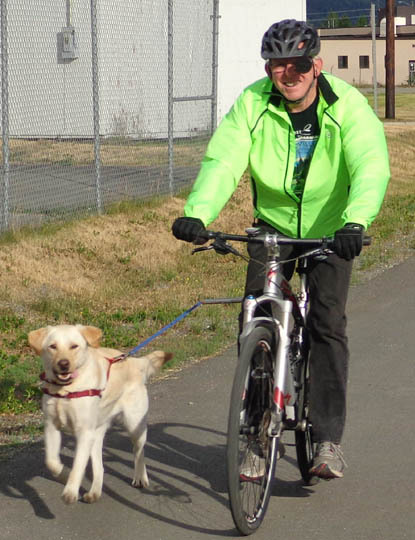 Jim has signed up for two long road relays that he'll ride solo on his mountain bike -- the 148-mile Kluane-Chilkat International Bike Relay from Haines Jct., Yukon to Haines, Alaska, and the Fireweed 400. It has options of 50, 100, 200, and 400 miles between Sheep Mountain on the Glenn Hwy. and Valdez; Jim registered for the 100-miler. now that he's training hard for two races in Alaska. We've also made a few more reservations at campgrounds in Alaska this summer than we did in 2012. Part of that is because we know better where we want to spend our time. 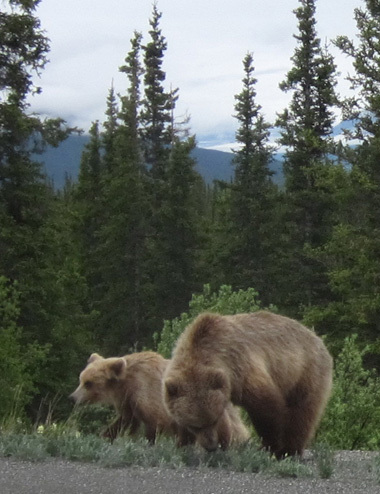 Another reason is that we expect to have to compete with more visitors to Alaska this summer for campsites. The economy has improved since 2012. Many more RVs are being sold, fuel is cheaper, more Boomers are retiring, and the state of Alaska is promoting itself like crazy. Come on up, everybody!! This is the year to explore the 49th state!! In addition, the dollar is worth a lot more in Canada than it was three years ago, making it less expensive to spend some time there on the way to and from Alaska. 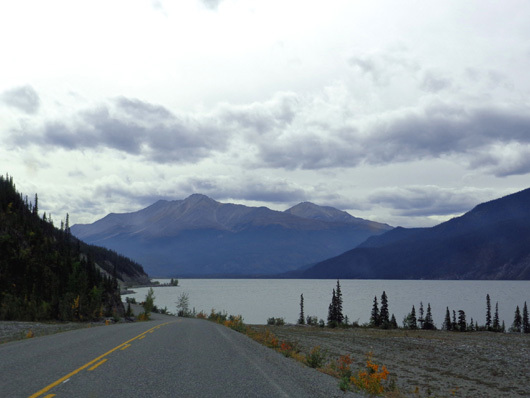 There are numerous scenic lakes along the Alaska Hwy. 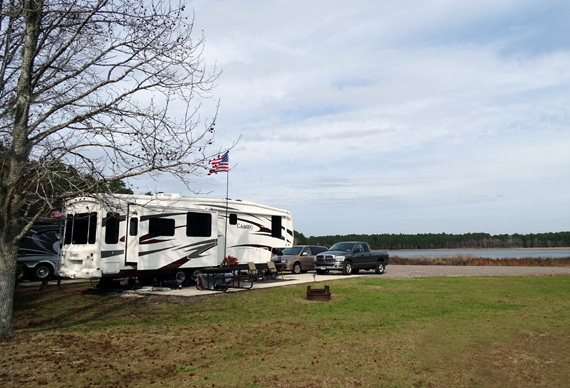 We aren't fond of making reservations ahead of time at campgrounds because it limits our flexibility. 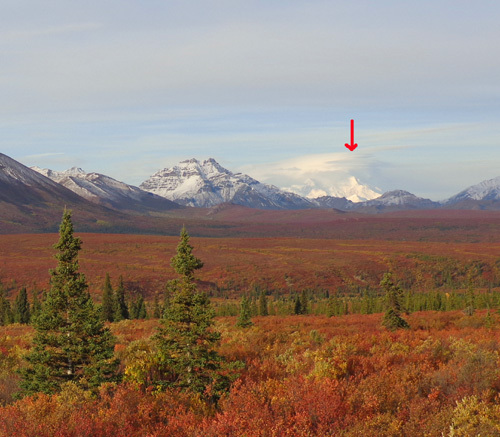 We reserved only one place in 2012 well before we arrived -- Denali National Park. It's hugely popular and spaces for larger rigs fill up quickly. That year we made some other reservations just a few days ahead of our arrival but mostly winged it. It worked well most of the time. Since it's even more critical this year that we reserve at Denali, we were on the phone on December 1, the first day to reserve a campsite and Tek Pass in the national park for 2015. We have reservations at Riley Creek and Teklanika campgrounds the last couple weeks of July, the peak for wildflowers, and at Riley Creek again in late August/early September when the fall colors should be spectacular. In 2012 we learned the hard way that it's good to make reservations as soon as possible at the Seward Military Resort, and not anywhere near the July 4th holiday when the place is mobbed for the holiday and the Mount Marathon race. This time we already have a confirmed space there in early August. 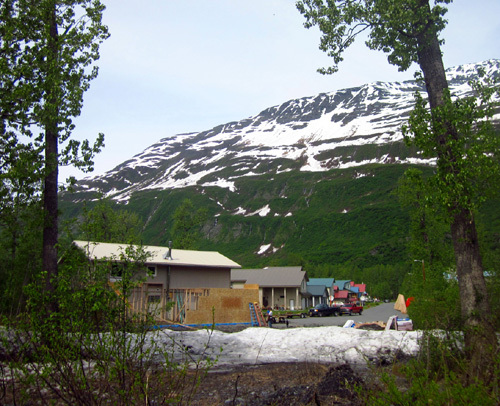 We reserved a site at Williwaw Campground in Portage Valley to use on our way to and from Seward, and a space at a private campground in Fairbanks in early September, just before we head back to the Lower 48. 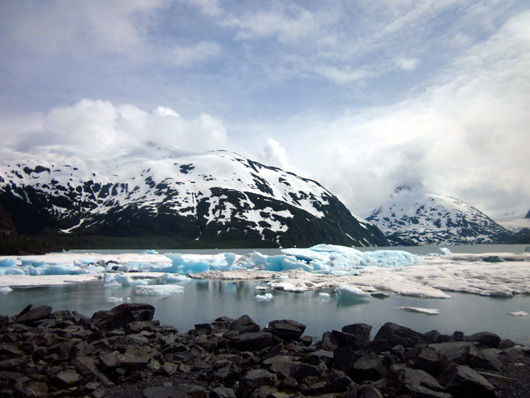 Blue ice from Portage Glacier floats in the lake by the visitor center in Portage Valley in late June, 2012. We also reserved two weeks at a private campground in June for Jim's bike race in Haines, and several days at another private RV park near the start/finish of the Fireweed 400 in July. That sounds like we have a reservation for every night we're in Alaska but that's only about half the time. Some of our favorite places, like JBER in Anchorage, are first come-first served so we'll have to trust our luck at those. Most of the campgrounds where we have reservations either don't have a cancellation fee or it is low, so if we change our minds and want to modify the dates or cancel entirely we won't be out a bunch of $$$. We reserve the right to change our minds at any time and for any reason! Our tentative arrival date in Haines, AK is June 9 so Jim will have some time to get acquainted with the Kluane to Chilkat bike relay course before the race. That gives us ten days to drive from Montana through Alberta to the Alaska Highway, through the northeast corner of British Columbia, and into the Yukon. We didn't spend any time in Whitehorse in 2012 because we were delayed in Watson Lake after the road washed out. 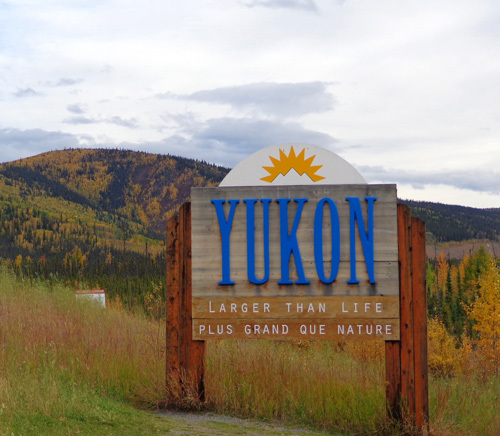 This year we want to spend a few days sight-seeing and hiking in the Yukon capital. After we leave Haines we still have at least a day's drive through the rest of the Yukon to reach the main part of Alaska. On the way back to Montana in September we'd like to do what we didn't do in 2012 because of early snow -- drive down the Cassiar Hwy. in British Columbia to Stewart-Haines and aim for Banff and Jasper National Parks via the Icefields Parkway. We'll have to play that by ear again. Stay tuned to see where we actually end up!